Welcome to StarStruck! 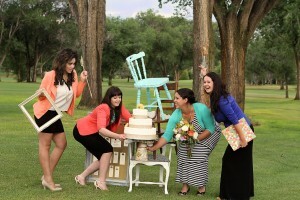 Event Planning, founded in 2008 and located in Prescott, Arizona. We believe in attention to detail and take a personal, practical, collaborative and balanced approach. We are dedicated and work hard to develop unique and memorable events. Hi there, my name is Tahna and I’m the owner of StarStruck! Event Planning. I am a native of Prescott, Arizona and I earned my Bachelors in Business Management from San Diego State University. I am well traveled, an adventurer, an avid hiker, and mountain biker. I’m a wife, mother, animal lover, daughter, sister, aunt, and best friend. I’m an entrepreneur and an advocate of merriment. I believe that life is to be traveled fearlessly, venturing on ALL the roads in front of you. When I told my mom I was going into the business of event planning, she giggled and quickly agreed it was the perfect career for me. As a child, I was a chronic list maker and constantly organizing and reorganizing anything I could get my hands on. I was the self-proclaimed director for all of our homemade neighborhood plays. I even designed and constructed my own outdoor forts. In 2009, I had the pleasure of combining all those qualities with my love for interior design, to design, manage, and construct my own personal dream home. My attention to detail, resourcefulness, ability in effective problem solving, communication, management, and organizational skills, combined with my creativity, eye for design, and ability to plan and throw a rockin party (all the qualities that an incredible event requires), have always made me the first person my friends and family go to for help with any kind of event. So after planning events for my loved ones, I decided to follow my passion and become a professional event planner. I enjoy all the small details that go into planning an event. I love that I can provide expert guidance and comfort amongst the madness. I love that my days are filled with variety and that I get to meet new people all the time. I love that I get to be a part of something lovely and unique. Life is all about your experiences; so dream up your ideal day, take a deep breath, and let us handle the rest! My name is Adrienne. I’m an Arizona native and grew up in the Phoenix area. I graduated from Arizona State University with a Bachelor of Science in Business Management and a Minor in Communications. Go Sun Devils! I moved to the Prescott area in 2007. I’m a proud wife and mother of two spirited little angels. I enjoy four wheeling and off-road sports. I love camping and hiking. My hobbies are focused around crafting and making things look beautiful. Event planning appeals to my meticulous and organized nature while giving me the satisfaction of being creative and making things beautiful. It’s truly the best of both worlds! My focus during the design of an event is attention to every detail and ensuring that guests have an esthetically pleasing and unforgettable experience all while keeping in mind the importance of creating a #hashtag worthy moment! I am so proud to be part of the StarStruck team. Each of us brings a unique set of strengths to the planning process. We compliment each other’s talents in a unique, flawless fashion and we add something truly special to some of life’s unforgettable moments. Hello, my name is Melissa. I grew up in the small town of Hope, New Jersey with my father and two sisters. At the age of ten, I begin flying airplanes. In 2010, I moved to Prescott, Arizona to pursue my passion for aviation and accomplished my lifelong dream of completing my pilot training at Embry-Riddle Aeronautical University. During that time, I met my fiancé and began to build a life with our wonderful two dogs here in Prescott. I have always been a hopeless romantic and love big events, especially weddings! I was so blessed to have met Tahna who saw my qualities that come with being a pilot as an asset to being an event planner and brought me into her amazing StarStruck team. I love coordinating every detail, being resourceful in tough situations, staying organized, and communicating with everyone. I always remain calm under pressure and excel at problem solving. My goal is always to help ensure your special day is one of the most wonderful and unforgettable experiences of your life. My name is Alexes and I am attending NAU-Yavapai pursuing my BA degree in Applied Human Behavior. I have been residing in Prescott for the past ten years. I have enjoyed acting and dancing for the past 15 years. I am a choreographer for a local theatre and also teach dance individually. I love being an event coordinator for Star Struck! I am passionate about bringing joy and happiness to others. It is beyond amazing to see the whole process, especially of a wedding, from the time the bride and groom first contact us with their wishes to watching them come to fruition and play out on their wedding day. My goal is to relieve stress, to listen, and to make sure your wedding or other event is the absolute best it could be.